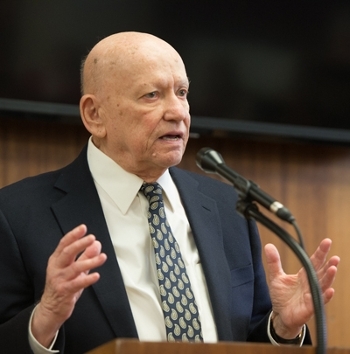 A crowd of SIUE administrators, faculty, staff, alumni and retirees attended the special event which honored Lazerson for the donation of his expansive collection of more than 2,000 books, comprising mathematics-focused materials he collected for more than 65 years. The President Earl Lazerson Collection will be preserved in the Louisa H. Bowen University Archives & Special Collections unit of Lovejoy Library. The book titles are listed in the library’s online catalog. During the reception, the University presented Lazerson with a commemorative photo and proclamation. Photo: During the reception, SIUE presented Dr. Earl Lazerson with a commemorative photo and proclamation. 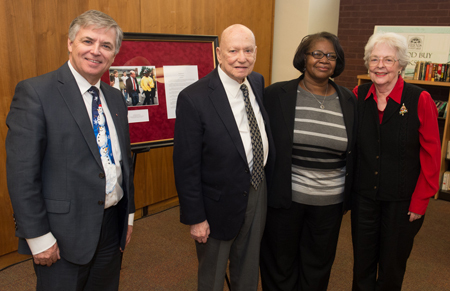 Standing (L-R) are Chancellor Randy Pembrook, Dr. Earl Lazerson, LIS Interim Dean Lydia Jackson and Mrs. Ann Lazerson. SIUE’s longest-serving president Dr. Earl Lazerson shared his delight to engage in conversation and comradery with campus community members.